Whilst yesterday was a postive one for silver spot prices, which ended the silver trading session as a narrow spread up candle, we are still in a tricky situation for the commodity which was once again helped higher by gold’s strong perfomance. 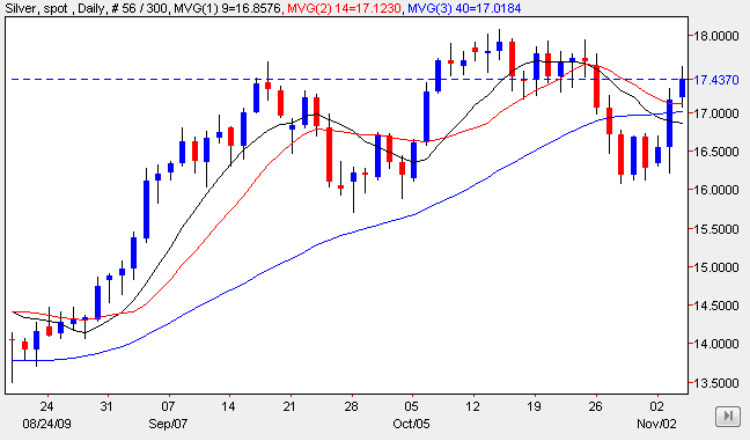 From a technical perspective, the low of the day seemed to find good support from the 14 day moving average below, a positive signal, but this must be counterbalanced by the upper body of the candle which ran into the solid resistance area now immediately above in the $17.50 to $18.25 per ounce price region. As I have outlined several times before, this area is now critical to any move higher for spot silver, and only a break and hold above this congestion will then confirm that the bullish sentiment remains firm, and this would then provide the necessary platform for a continuation of the recent rally higher. However, until this has been confirmed we cannot be certain that the upwards momentum will continue, despite the pull through effect from spot gold, which once again performed well yesterday as it approaced the $1100 per ounce price handle. So in summary for longer term trend trading we need to see a break and hold above the $18.25 per ounce region which will then give us a signal that silver prices are set to rise further in the medium term, whilst any failure at this level could suggest a retest of suport in the $16.75 price level or below. If you are looking to trade silver online just send me an email & I will send you a link to a free MT4 download. Good Luck.